← Book Of Concord, Sunday Edition! Spend much time at all among Lutherans and you’re likely to eventually hear the phrase “proper distinction of Law and Gospel”. This is something we cherish — the preaching of God’s Law along with the soothing words of His Gospel predominating. Yet, we aren’t a perfect lot, and sometimes we can find ourselves drifting away from this right balance, falling to one side of the sword edge or the other — diving into a Gospel reductionist mindset (where we downplay the importance and necessity of the Law) or wandering into Law-Law-Law territory. While both deviations are equally possible, it is the latter that has me up at 4am writing, rather than attempting to catch more sleep. Now, I don’t know if I’m just blessed, but lately I’ve come across a good number of folks crushing their neighbors with the law, with very little, if any, gospel — emphasizing what one must do and how one must act, with no mention of what Christ has done. And so, as silly as this may be, I want to quickly hash out a laundry list of things that do not, in fact, offer salvation. Of all the amazing gifts God promises us in His Word — you know, like eternal salvation and freedom from sin, death and the devil — yeah, a spouse is not included. Yes, some are blessed with the joy of marriage. And some are not. Being married does not earn us our salvation, nor make us a better Christian nor more valuable human beings or members of society. There is no special Heaven for those who have a spouse. I think that in view of the present distress it is good for a person to remain as he is. Are you bound to a wife? Do not seek to be free. Are you free from a wife? Do not seek a wife. But if you do marry, you have not sinned, and if a betrothed woman marries, she has not sinned. Yet those who marry will have worldly troubles, and I would spare you that. And while it should go without saying, I will state the obvious anyway to avoid any confusion. I happily support marriage and tout its benefits for individuals and society, but it is not and should not be elevated so high as to hurt our single neighbors. Yet another gift of God’s which is not promised to us is the gift of children. While it is a sad reality in our world today that people are quick to say “no” to God’s blessings of offspring, the number of our brood or the ampleness of our fecundity does not have any bearing on our salvation or justification. So while we might believe the family who is open to children on God’s schedule rather than their own, is adhering more to God’s command to “be fruitful and multiply”, we should also not insist the family who decides to prevent children or the family who cannot have children is therefore doomed for the fiery pits of hell. For the family who is blessed with children, how they mother or parent also plays no direct role in their salvation. The Christian mother who works outside the home and must send her children to daycare is just as equally forgiven as the one who stays home. We do not each have the same gifts and talents, and God — the one who makes mothers — equips us with the daily bread we need to serve in their vocation. While we may believe in an ideal situation where mothers have husbands and mothers need not work, we must recognize that that ideal may not be possible in our sin-tainted world. What matters is teaching our children the fullness of the faith. Yoga pants or high-collared, ankle-length prairie dresses — Christian women who confess Christ as Lord and Savior, who believe Jesus died on the cross for the forgiveness of their sins are saved regardless of their chosen attire. And that’s all I have to say on this topic. Whether we make gourmet meals from scratch every night and keep our house spotless with nary an unfolded garment or stray crumb or we struggle to stay on top of the laundry and step over a mess of toys on a daily basis, our housekeeping abilities do not weigh in on the matter of our salvation. Seriously. While yes, a well-kept home is a blessing and a service to our closest neighbors, it does not earn us a gold star or secure us that golden ticket to God’s promise of Heaven. This is, by no means, an exhaustive list — I’m sure you can come up with a few of your own that are often held up and held over our heads. After all, this is one of our Old Adam’s favorite past times — finding ways to have a hand in our salvation. Our Old Adam does not like being sidelined, does not like accepting or believing that Jesus paid the bill in full on that cross and that there is nothing left to be done. No, our Old Adam wants to hold up God’s Law above the Gospel, as a checklist to puff us up into thinking we’re doing better or we’re doing more. And no, this is not to say the Law is bad (ahem, rightly divided, not rightly discarded… got it? ), nor is this to insist that these items are in themselves bad, for in many ways these are good and healthy and blessings for us and for those we serve. However, we do no one any good — and actually often do harm — by making these the end-all-be-all of our justification as Christians, leaving Christ crucified on the sidelines in favor of playing to our Old Adam’s vanity. We love our neighbor by, yes, reminding them of God’s Law and bringing them to repentance when and where it is necessary, but we must always be pointing them back to our Lord Jesus Christ who has already fought and won this battle over sin, forgives all, and has declared it finished. Correction on Law/Gospel balance quotation- thank you for the astute eyes, readers! Thank you for posting this essay. I was surprised that some of the commenters became so contentious right from the start concerning the opinions of others. Your essay today brings the right perspective to this new blog. Just a quick observation. We never “equally balance” Law and Gospel. The Gospel must always predominate! Walther, Thesis 25-“The Proper Distinction Between Law and Gospel”. The comfort must be there in great abundance! Well…..did God not say we should be fruitful and multiply? Did Jesus not speak about the importance of marriage to one woman? Is it not important to distinguish the Law from the Gospel? Is modest dress not a good idea, especially in church? Does the Bible not encourage women to be modest, knowing that dressing in a sexually alluring way has an effect on men? It is true that salvation is not based on compliance with these things, but it is by the grace of God, by the finished work of Our Lord at Calvary, and a relationship with Jesus is foundational to our faith….yet….we must still look at the multitude of biblical references to obedience, and to conscious choices and habitual preferences to seek righteousness and behavior which attests to the genuineness of our walk with God. The process of sanctification and the means of grace in the sacraments will inevitably enable believers to exercise some self control….and we take no credit…but it is the inward working of God. 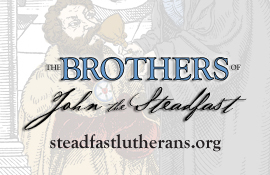 I know of few examples of Lutherans I have known who take a hard and legalistic approach to witnessing to others. Most of us will be the first to admit we are sinners saved by grace alone, and we point to Jesus as the only way to salvation(John 14:6 and John 3:16 for ex). It does not take very long to include a few words about law and grace, and in our witness to others, it is part of our proclamation of Christ and the Gospel message. Vanessa, I hate to be the wet blanket here, but this is straight-up Gospel Reductionism (one of the main errors our synod fought against in the Seminex era). I know you’re somewhat new to Lutheranism (I like and follow your blog:), and I really do appreciate your writing and your efforts here, but this article was not well-considered. Bill Metzger- good catch, it’s been corrected. Thanks! Don’t worry, Vanessa, maybe some day when you’re not such a new Lutheran anymore, you’ll realize that it really is all about you and what you do and not so much about Jesus. I, for one, pray you don’t ever become an “expert” Lutheran like all these others. Thank you for calling our attention back to Christ and His work accomplished for us! I think this paragraph makes a great point that serves to distinguish between the Law rightly used and a self-serving “law”. A Christian understands that the law’s primary purpose is to show folks their sin… so that they might see Christ and receive His forgiveness. There are times, however, when people will use a “law” to denigrate people who dare question their man-made sacred cows. What you can see and spot in this is not a desire lead to forgiveness, but rather a back handed elevation. It’s almost like unto Martha saying to Jesus, “Lord, do you not care that my sister has left me to serve alone? Tell her then to help me.” That’s an attempt at self-serving, self elevating law. Tell Mary to be more like me! But, as you rightly pointed out – housework doesn’t save – and Christ Jesus is much better. =o) Solus Christus! If you are married, have babies, modest clothing, and an impeccable house, you don’t need Jesus. Whodathunk it?! Saying you’re not saved by works, but by grace is not gospel reductionism, it’s just the gospel. Sorry, to previous commenters (Pastor Buetow? ), if my objection struck a nerve. I’m wary of extremes (Gospel no Law; Law no Gospel), because they’re all too appealing to me, honestly! Probably because of my own quirks of personality, I resist any attempts to make the Christian life seem at all comfortable or easy (to me, it isn’t; and whether I want to go antinomian or legalistic, I’m still hard at work justifying myself, still under the law). Gospel reductionism (I readily admit: not now the greatest of our worries) is problematic (as far as I understand – very much open to correction here) because by minimizing sin, it ends up minimizing the Gospel – and that’s really my main concern. But my phrasing, and even the characterization of the whole post as ‘gospel reductionism’ was unfair, which I can see now (in hindsight), and I do apologize, Vanessa, for coming on a bit too strong there in my criticism (especially since you mentioned it there in the opening paragraphs, so quite obviously Gospel reductionism was not your intent or purpose). You nailed every point. Perfect. Alison you do not need to apologize. I believe your initial reaction was correct and the Gospel is being misused in this article. Many of the points made by the author are Gospel reductionism or straw man arguments at best. Take the point about children. No one says that not having children damns you to hell, that’s a straw man argument. No one I know, not even the Baptists, would make the same contention the author makes at the end that any one of these points are the end-all be-all when it comes to justification. Not having children or preventing pregnancy, for instance, IS against Scripture though and has/had been the teaching of the church up until about 60 years ago. But the article uses the Gospel as an excuse to say, “Stop judging me.” The Gospel can be wrongly used as a way to shut down what may be legitimate criticism. I could go on, but you are spot on. The Gospel is used in almost every point to do away with the Law. The Gospel did not come so that we could say, “Screw the law” but rather so that we would walk in the Law of the Lord and delight in it day and night. When reading this, I felt that the points she brings up are legitimate because, while people may not outright say “You are going to hell because your parenting philosophy is different than mine”, what often happens, especially between mothers (and especially online) is that we ACT like these things matter enough to send people to hell. So no, you will probably not hear a pastor at the pulpit telling people that the state of their house will take away their salvation, but the way we treat each other can certainly come off that way. But I was raised Mormon, and they do believe marriage is essential to getting in to the “celestial kingdom”. If you don’t get married in this life, you have to after you die, because you are not getting in otherwise. And they do teach “grace after all you can do”. So what she wrote is not a far stretch for me. She is not saying “screw the law, sin all you want, you’re covered”, but rather that we are all sinners regardless of how hard we may try not to be. We all have need of salvation, and none of these things can take away what Christ has done for us. There is so much mean spirited-ness over these points. Perhaps women see them more often? So I appreciate this post and the reminder that my salvation is secure in Christ because of His grace, and not my efforts. And *nothing* is reduced! And the cross is magnified! I think the article is an over reaction to an issue that doesn’t exist, that’s all. Take the basic premise: 5 Things that don’t offer salvation. Where has the author shown that this is a problem? Like I pointed out, apart from perhaps Mormons, not even the Baptists I know would say that housework or marriage save you. So we’re starting with a straw-man argument. What I more than likely believe is going on is what happens with my own wife :-) and really, any of us. We overreact. Someone says something about our yoga pants and we think they are questioning our salvation. This is again, a false premise. If I question my daughters choice of clothing it is not because I believe she isn’t saved, but because I think she is dressing in a way that is not reflective of who she is. That’s a huge difference. And if I can’t talk about how my daughter dresses without being accused of questioning her salvation then we have become exactly what Alison says, Gospel reductionists and antinomians. Second point is that some of the things in the article are just plain wrong. Choosing not to have children is not the same as being unable to have children. As I pointed out, the church has always seen birth control as contrary to Scripture. So if someone talks about how many children you have, they are not questioning your salvation (straw man alert!) but rather they are pointing out that your behavior is not in keeping with what Scripture teaches. Does the Gospel forgive us for these things? Absolutely. But the Gospel is not an excuse to ignore the law or refuse to walk in it. I think we are all ‘self-justifiers’ to one degree or another. It’s in our (Old Adam/Eve) DNA. So we need to hear that Word of law…and the gospel, over and over and over. We live from faith…to faith. And faith comes by hearing. That’s somewhere in the Bible I think.